Written by Wei-Chia Chen, Ammar Tareen, and Justin B. Kinney. SUFTware (Statistics Using Field Theory) provides fast and lightweight Python implementations of Bayesian Field Theory algorithms for low-dimensional statistical inference. SUFTware currently supports the one-dimensional density estimation algorithm DEFT, described in , , and . 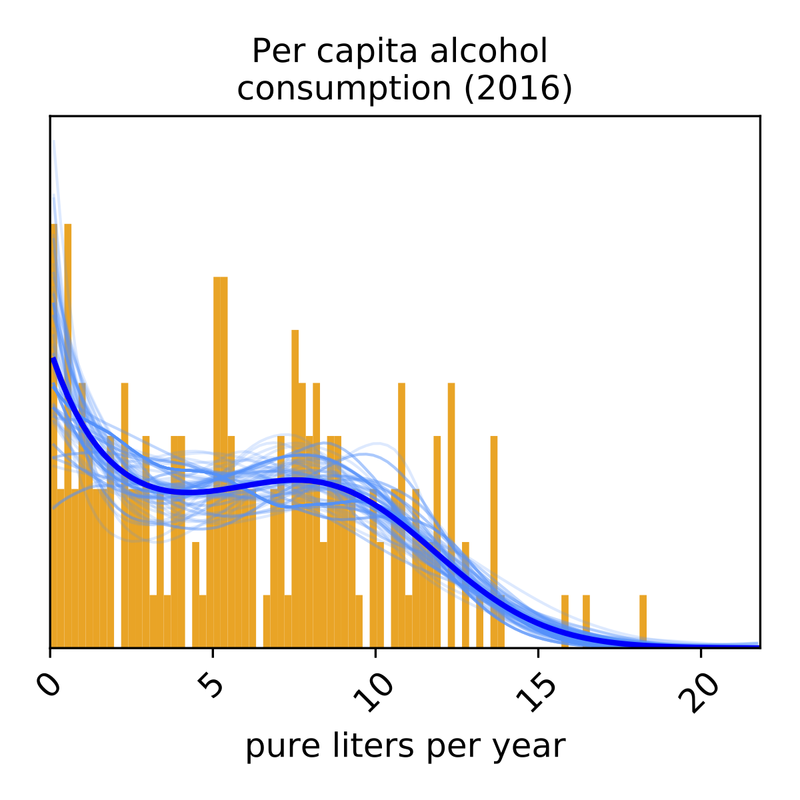 The image on the right shows DEFT applied to alcohol consumption data from the World Health Organization. This computation took about 0.25 seconds on a standard laptop computer. Code for this and other examples can be found on the Examples page. The Tutorial page contains a short tutorial on how to use SUFTware. The Documentation page details the SUFTware API. The code for SUFTware is open source and available on GitHub. For technical assistance or to report bugs, please contact Ammar Tareen. For more general correspondence, please contact Justin Kinney. Chen W, Tareen A, Kinney JB (2018) Density estimation on small datasets. Phys Rev Lett 121:160605. PDF. Kinney JB (2015) Unification of field theory and maximum entropy methods for learning probability densities. Phys Rev E 92:032107. PDF. Kinney JB (2014) Estimation of probability densities using scale-free field theories. Phys Rev E 90:011301(R). PDF.